Food Costs > How Much Does Blue Crab Cost? How Much Does Blue Crab Cost? The blue crab has an olive green carapace and brilliant blue claws for males and red-tipped claws for females. They usually appear from early spring to late fall, and they tend to live in shallow, brackish waters as well as muddy bottoms. Blue crabs can make a great meal since they can be steamed and eaten whole, or the meat can be used as an ingredient in other dishes, similar to other crab meat. Live blue crab is usually purchased by the dozen, with each crab weighing about one-third of a pound, and each dozen should cost around $25 to $85. The costs can greatly vary depending on the size of the crabs since the larger the crab, the more meat it will yield. Females, on average, tend to be 30 to 50 percent cheaper due to their smaller size. Also, your geographical area, where you live and who you purchase from can all affect the costs as well. For example, at LA Crawfish, they charge $84.99 per pound for jumbo blue crab and $54.99 for live Louisiana blue crab. On Amazon.com, two dozen soft shell blue crab retail for about $75. If purchasing by the pound live, plan on budgeting around $3.50 to $6. If buying by the bushel, which is usually around three to ten dozen, the costs can range from $95 to $320, depending on the season, the seasonings, the quality, and the size. The Baltimore Sun had a sample list of 30 blue crab prices in the Baltimore, Maryland, area, with prices ranging from $44 to $75 per 12 large males. 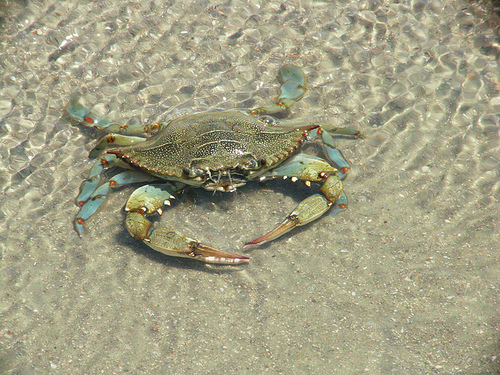 Most crabs can be found in Chesapeake Bay area, according to Fishchoice.com. Unlike most other crabs produced in the United States, the blue crab should be a much better buy in summer. The price of a bushel of male crabs in New York should drop below $40 when landings peak. The company MarylandBlueCrabExpress.com offers a variety of blue crab choices. Here, a bushel of steam blue crabs can cost anywhere from $90 to $155 depending on the size of the crabs. In a typical bushel, there will be three to four dozen depending on the size. The cost of blue crabs will depend on whether they are purchased fresh, pre-cooked, or frozen. You could also buy only the blue crab meat only instead of the entire crab. If you are able to the blue crab directly from the docks, you will often get the cheapest price and best quality since you can cut out all the markups of the middlemen. Blue crabs are in season from June to October, so the prices will be cheaper during this time. The rest of the year, you will probably pay more, but the year also matters since, sometimes, the harvest can be really high one year and down the next. Cities that are closer to the coastline will see much lower prices than the states in the middle or on the opposite side of the east coast. Also, the actual location where you buy the blue crab, whether from a fresh seafood market, grocery store, or restaurant, will greatly affect the cost. Purchasing online may incur additional charges, especially if you don’t meet the retailer’s minimum spending requirement. If you want to the crabs boiled ahead of time, you will more than likely be charged a “per pound” surcharge. If you purchase blue crab online, it will be shipped, generally overnight, on dry ice. Blue crab can often be purchased live, frozen or the meat can be harvested and placed inside a vacuum sealed bag. Blue crabs can be found in various sizes and shades and are generally grow up to nine inches long from point to point and four inches long from head to tail, according to the University of Rhode Island. The Blue Crab, while harvested in many parts of the world, will primarily come from the coastal waters of North Carolina, the Chesapeake Bay and parts of Florida. If you are planning to purchase fresh blue crabs take note that they are likely going to die during the transit. The crab’s shelf-life is less than seven days for most soft-shell crabs. Watch out for damaged crabs. If the blue crab smells bad (like ammonia), you should not attempt to cook and eat it since this can pose a danger to your health. If buying by the bushel, the average bushel can feed up to ten people. Try to buy blue crabs during the summer season, which, as mentioned, is the peak season and the time when the prices are the cheapest. If you live near the coast, consider buying fresh off the docks for the cheapest and freshest prices possible. If you need more than three dozen, then you will often be better off buying the crabs by the bushel.